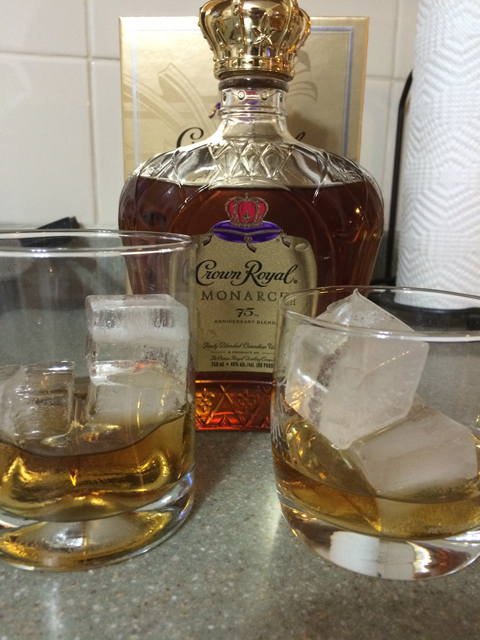 I’m a regular drinker of Crown Royal, mostly Crown Royal Black, which I blogged about two years ago. I rarely get regular Crown Royal due to my love of the Black variety and it’s smooth flavor and extra 10 proof [it’s 90 proof vs. 80 proof for regular Crown]. 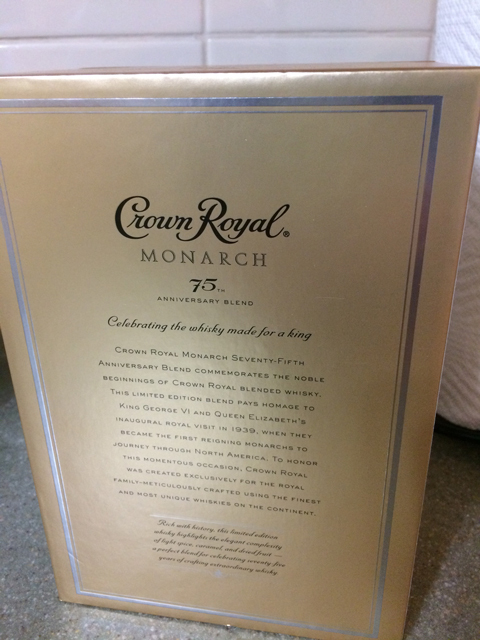 So when I heard that Crown Royal was making a special 75th anniversary blend, I had to find it. 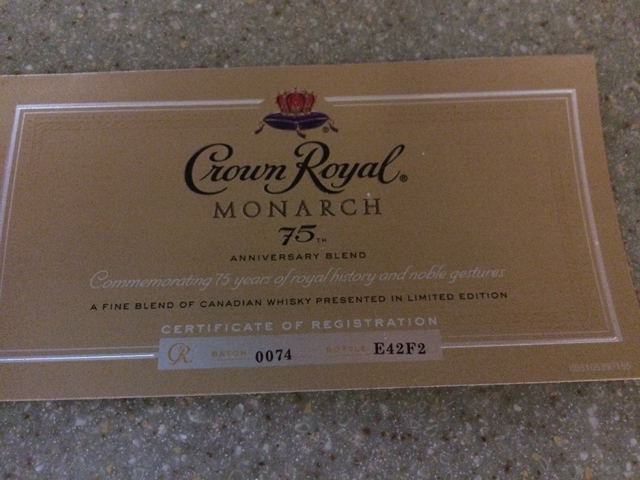 I traveled a good amount last year and in all of the places I looked, in several different states, I was not able to find the Monarch 75th Anniversary Blend. Back in Utah, I was at our state-run liquor store a couple of days before Christmas and what did I find on the shelf next to the other Crown Royals? Yes, a bottle of the 75th Anniversary Blend. At $76 for the 750ml, I didn’t hesitate to purchase it. Being the special blend that this is, I had to take you through the entire process of removing the bottle before pouring a couple of glasses of it. 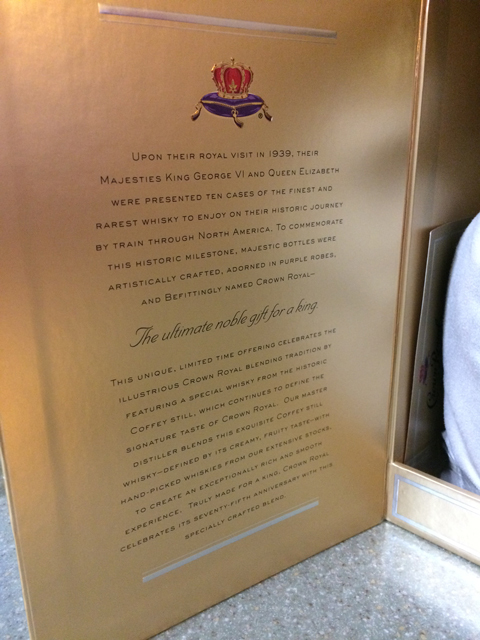 The box is a nice tone of of gold, with the front displaying the Crown Royal name and colorful logo. Note that this is an anniversary blend, not aged 75 years. Just wanted to make that clear. Can’t imagine how costly a bottle of whisky aged 75 years would be, or what it would taste like. 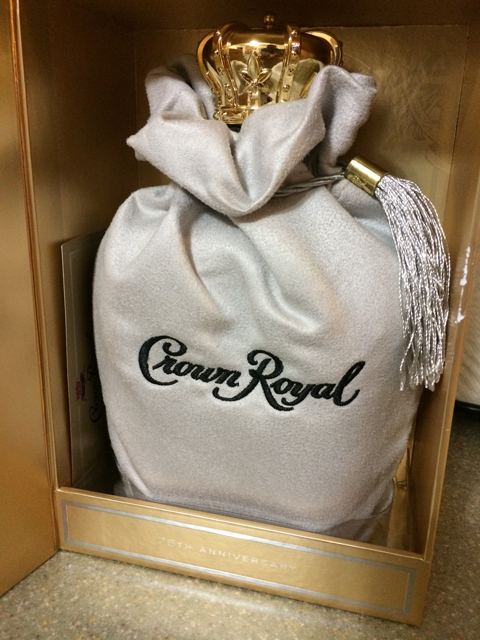 Each bottle of Crown is enclosed in a cloth bag. 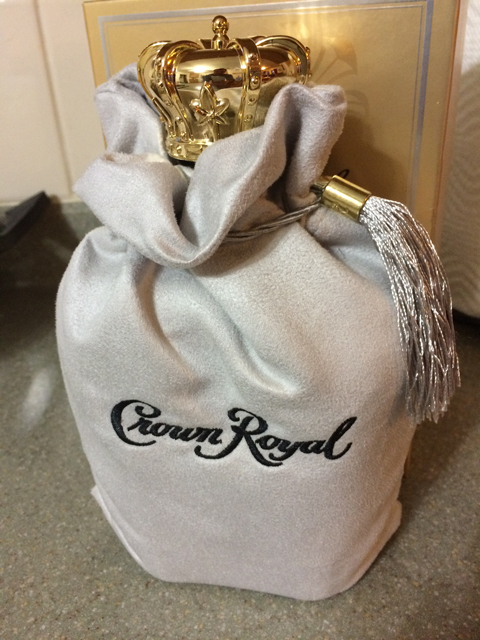 Crown regular is a purple bag, Crown Black is black. I was kind of expecting this to be a gold bag, but they decided to go with white. The bag is much thicker than those that encase standard Crown blends. Regardless of the white color, this bag is a keeper once this bottle is empty. For the record, I keep every Crown bag. Usage of these bags are a subject for a future blog post. A certificate that verifies what batch this is from as well as the bottle number is quite impressive. The certificate numbering closer up. Again, I’m impressed here. Removing the bottle in its bag from the the box, this presentation is pretty cool. And this is before I’ve even cracked the cap. 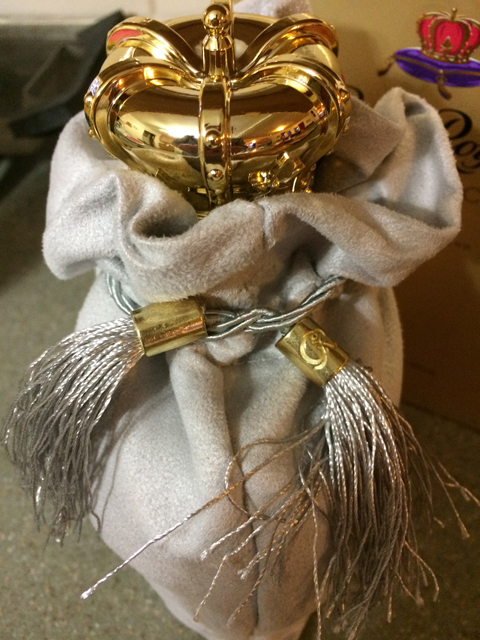 A closeup of the cap and the detailed tassels that tie the bag to the bottle. Another round of praise for the packaging detail. Opening up the bag and taking a peek inside. The first photo of this post at the very top shows the bottle unbagged. Alright. 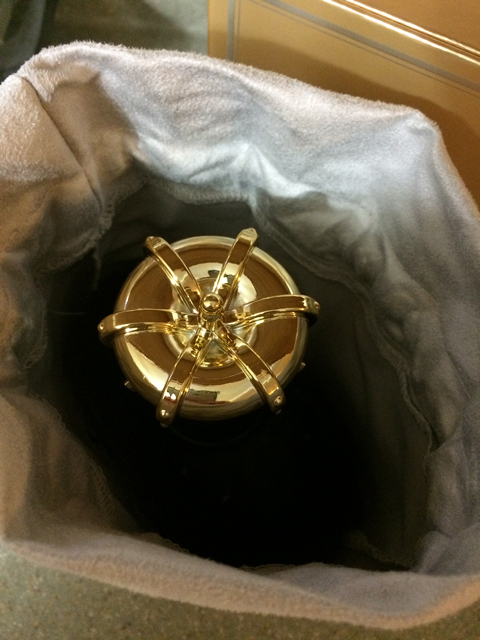 Unboxing completed, we now go into detail on how this smells, pours and tastes. First off, unlike how I consume Crown Royal Black, which I mix with Sprite, this is too nice to mix with anything but a couple of ice cubes. I also recommend serving it neat at room temperature. Twisting off the cap, it’s sealed, so there’s some resistance when opening the bottle. It makes a slight “snap” noise as I twist, which tells me this was planned well. No plastic cellophane to remove here, folks. The taste of this is incredible. I’ve had Crown XR before and it’s really good. This is a tad smoother, according to my taste buds. 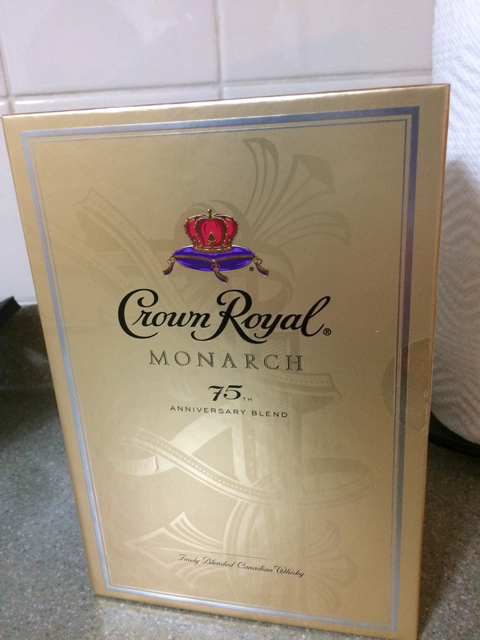 Savoring each sip, I am in whisky love with this Monarch 75th Anniversary blend. I probably won’t be able to find another bottle of this, which now in hindsight, makes me wish I would have purchased two bottles of this. At the time, cost was a prohibitor. If you can find a bottle of this, and love Crown Royal as much as I do, I recommend you buy it. 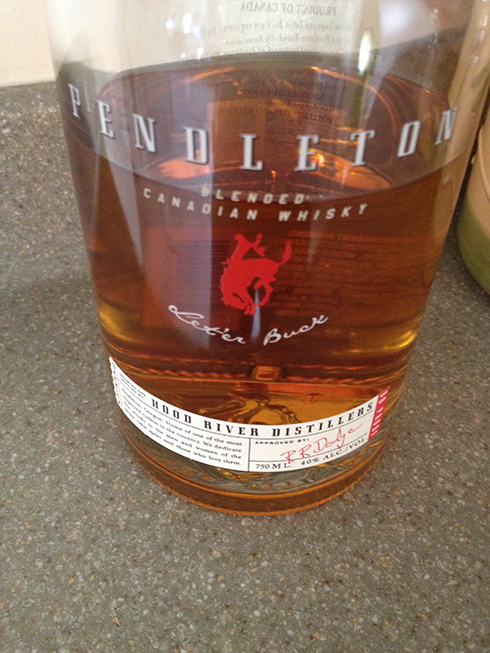 You will like it’s smooth flavor and the great taste of a well-made Canadian whiskey. I wouldn’t steer you wrong here. I’m not sure that I’ve ever had Crown Royal. Might need to remedy that one. I will be curious to how you like it once you’ve tried it. 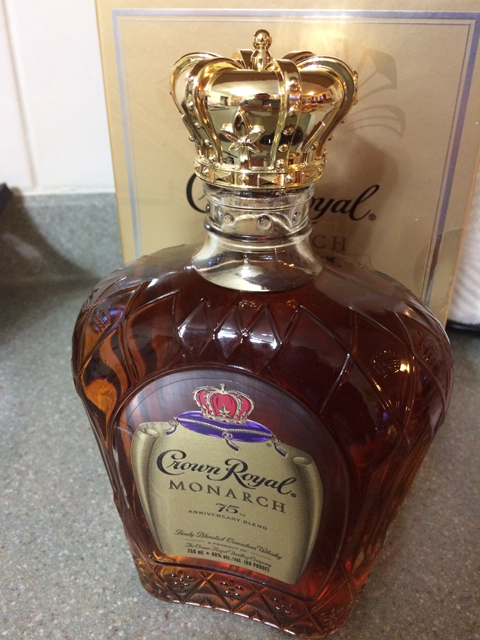 I bought this monarch 75th bottle. I am wondering if unopened, will the value of this bottle increase? I have a very special ocassion coming up in the next 6 months that I am tempted to toast with this bottle. But I don’t want to drink it if it’s value will increase. The value of this bottle might increase over the course of several years, but I still see it on store shelves at various liquor stores across the US for around $80 (which is what I paid for it). So I wouldn’t think the value would increase at all. 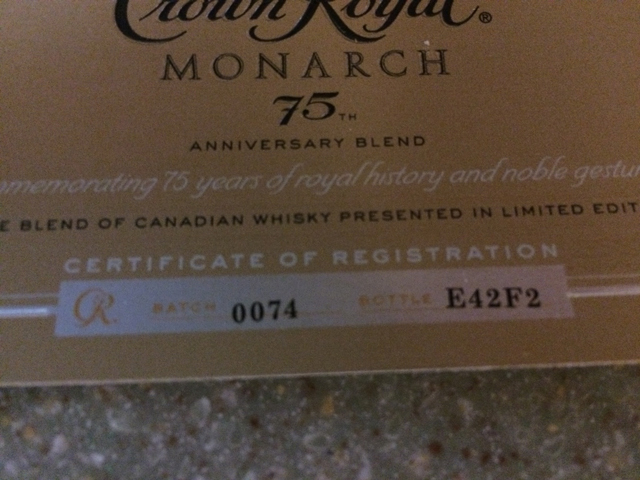 Can I purchase Crown 75 in Oakville? I would assume this is available in Canada and in your area. I would check your local liquor stores to see if it’s still available. It was a limited release, but I was still seeing bottles of it here in the states as recently as two months ago.